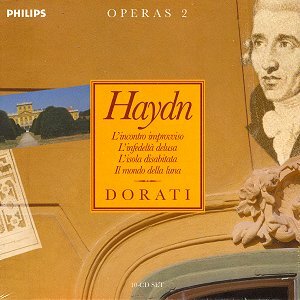 This is the second of Philips� re-issue boxes of their Haydn opera series. As with the first volume notes are concise and apposite though minimal with plot synopses but no libretti. Many of the singers are common to both boxes and as before they are consistently fine, as is the often under appreciated Orchestre de Chambere de Lausanne � so a word of retrospective kudos for the band at the outset. These ten CDs contain four operas and some of the arias Haydn wrote in other contexts, the three Arie e Terzetto and the Eight Arias � where he produced his own music for other composers� works staged at Esterháza. L�incontro improviso (1775) is an abduction aria along Seraglio lines. It�s light-hearted and cast in essentially brief aria form with the greatest emotional power reserved for the soprano duet in Act I and there are plenty of buffo opportunities for the men (relished with enthusiasm here). This is a recording where Dorati�s handling of the numerous secco recitatives proves less than agile � it was a feature of the opera series as a whole though not as pronounced in some as it is, say, here. Nevertheless there is a huge amount to enjoy. After the Overture, brimful of portent and Turkish colour, and the opening arias we come across a nonsense patter duet between Osmin and Calandro, Domenico Trimarchi and Benjamin Luxon respectively, the high spirits of which are infectious (and only slightly dampened by the slowness of the succeeding recitative). The florid, angular and exceptionally difficult Act I aria Quanto affetto mi sorprende is superbly taken by soprano Linda Zoghby, one of the great adornments of these recordings - she has a fine coloratura and a mezzo heft to her chest voice. That soprano trio, so anticipatory of Così fan tutte, is blemish free and a moment of exquisite poise amidst the buffo maelstrom that surrounds it. To analyse Dorati�s way with those controversial secco recitatives listen to Ali�s Indarmo m�affanno di veder Osmin. This is a particularly dramatic example and begins well but tends to lose impetus and dramatic shape as it develops; a pity. But Ali, the estimable tenor Claes H Ahnsjö demonstrates in the following aria just why he is so prized as a Haydn tenor � elegance, fluidity, flexibility across the range � and power. The highlights of the Second Act are many but even amongst the many there is the buffo recitative Dico e ridico, Dorati�s perfect tempo for Balkis�s aria Ad acquistar gia volo and Osmin�s remarkable Senti, al buio in which expectation, drama and sheer zaniness all co-exist quite happily � and what a big and commanding voice Trimarchi has and how well he deploys it. Zoghby�s Act III S�egli e vero, a cavatina of captivating beauty, is probably the high point of the amusing, witty and sufficiently sensitive last Act. L�infedeltà delusa (1773) is a tightly and compactly constructed opera, the last of Dorati/Esterháza operas that these forces recorded. The overture is witty and rather charming, the theme rustic, the performances once more impressive. Bravo to Barbara Hendricks in Sandrina�s Act I Che imbroglio � superbly sung. Vespina is Edith Mathis and she is in youthful and fresh voice with her Act I highlight Come piglia si bene la mira. The finale of Act I is a quintet of surpassing beauty and carries with it pre-echoes of Così with a Despina-Susanna like slap. Indeed Vespina�s Act II aria, a meditation and lament on age is depicted in the full glory of Enlightenment wisdom whilst Hendricks sweeps authoritatively and powerfully through her arias. The finale, a joyous quintet, is augmented orchestrally by springy trumpets and a true sense of culmination and resolution. L�isola disabitata is even more compact than L�infedeltà delusa and dates from six years later. Dorati uses the Robbins Landon edition. The opening Sinfonia is stern and unyielding and sets the tone for a work that adheres quite closely to the Sturm und Drang period of Haydn�s compositional life. After the Sinfonia he withholds the first aria for a daringly long time, preferring to preface it with two long secco recitatives and this faithfully reflects the balance throughout between aria and recitative. Linda Zoghby, as Sylvia, proves once more the standout soprano; her Act II aria Come il vapor s�ascende is a florid one, especially in the context of this essentially tough work, but she surmounts all obstacles, expressive and technical, with astonishing ease. Gernando is the ever-excellent Luigi Alva who has a fine turn in the witty Giacche il pietosa amico with its accompanying solo violin and the final quartet resolves matters nicely; bold and protracted at over ten minutes it centres the emotional heart of the work definably and acts, in retrospect, as the inevitable point to which the opera was inexorably moving. The preponderance of recitatives (too slow again, alas) will always make this a problematic work � but it has moving depth for those who know where to seek it out. Il mondo della luna is a well-known comedy, splendidly treated by Haydn, and one in which a strong cast prove equally impressive. Recitative and instrumental interludes feature strongly. Domenico Trimarchi sounds almost Leporello like in his blustering La ragazza col vecchione and Luigi Alva returns to the Haydnesque fray as Ecclitico, the fake astrologer, spinning his wares with insouciant and soothing charm (all false of course) in the (nevertheless) delightful Act I aria Un poco di denaro. Arleen Auger is impeccable and enormously characterful as Flaminia (sample Act I�s Ragion nell�alma siede) The scheming of Cecco, taken by the honeyed tenor of Anthony Rolfe Johnson is well conveyed through thought-process registral leaps and a conversational manner and Edith Mathis certainly takes her place in the sun in Act II with her powerfully sensitive singing of Quanta gente che sospira. The smaller interpolations into other works are gallantly done and similarly successful. Both box sets are notable acquisitions for the shelf. The performances still sound fresh and convincing in most important areas and will repay close scrutiny.